You may call this a misleading headline. Right? ...before someone else tricks you to visit any malicious link with intent to hijack your Computer or to Hack Facebook Profile, I just tricked you to visit this 'WARNING' article about Facebook Scam of the Dislike button. Facebook users are being targeted in a new scam that takes advantage of the recent widely publicized announcement by Facebook CEO Mark Zuckerberg that a 'Facebook Dislike Button' is in development. Zuckerberg said that there're obvious moments in life or bad fortunes where people do not want to "like" posts and wants to express their empathy. He also confirmed that the social network giant was working on such technology but didn’t say that it’s actually a "Dislike." The much-vaunted "Dislike" or "empathy" feature has not rolled out just yet, but has arrived on Facebook by the scammers that are making use of this announcement to help spread malware on users' systems. Scammers are offering links to 'Get Newly Introduced Facebook Dislike Button on your Profile [sic]' that actually direct users to a specific site in order to collect their sensitive information and install malware on their machines. So next time when you come across any social media posts that claim to offer such features, you are strictly advised to avoid clicking it. 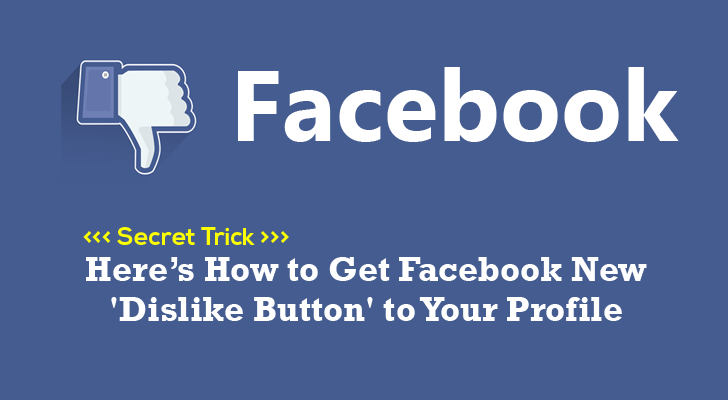 You should also Share this article with your Facebook/Twitter Friends... Trick them... Educate them...! However, in case you are curious to know how the dislike button would look like and how it would work, you can go on to read this article on The Hacker News: Here's How Facebook 'Dislike or Empathy Button' Would Look Like.